I hope that everyone enjoyed their beautiful 4th of July. Just want to send a big thank you to the farm crew that worked on the holiday! I will be doing a cooking demo this coming Saturday at the CSA barn at 12 pm using fresh produce from the farm, including fennel, cucumber, zucchini, Swiss chard, and kale. I would love to meet you so please come down and check it out. 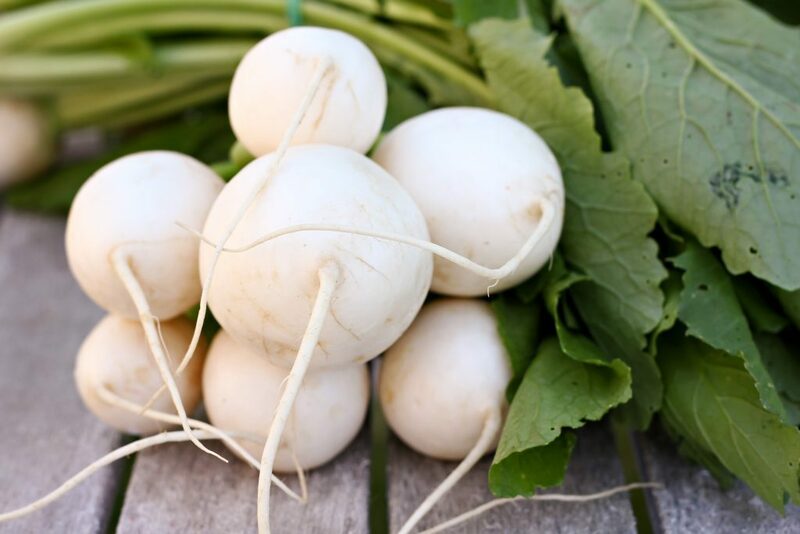 Hakurei turnips are native to Japan and are another gem from the vast Brassica family. They are similar in taste and texture to a radish. While crisp, slightly sweet, and mildly spicy, they have less of a bite and a smoother texture than radishes, especially when young and small. Like other turnips, both roots and greens are edible. The roots and are high in vitamin C, and the greens boast high levels of vitamins A, C, and K as well as calcium. Hakurei turnips are known as salad turnips because are wonderful raw, particularly in salads. They can also add a unique complement to crudité platters and a surprising yet tasty addition to sandwiches. For an interesting side dish, try slicing them very thin, drizzling with a little extra virgin olive oil, lemon juice, salt & pepper, and then sprinkling with grated or shaved Parmesan cheese. The roots can also be lightly cooked. They are wonderful sautéed with bacon until just tender and starting to caramelize. They can also be braised and roasted, but be careful not to overcook as they can become mushy and lose their delicate flavor (see recipe below). Hakurei turnip roots are also fun to pickle. Click on the recipe below for an example. Harukei turnip leaves have a wonderful bite, while not nearly as spicy or bitter as, say mustartd greens, and can be eaten raw. Slice thinly and add to your favorite lettuce mix to add a little zip to your salad. The greens can also be quickly sautéed or steamed like other tender greens such as Swiss chard and spinach. To store, separate the leaves from the bulbs. Wrapped in a paper towel and placed loosely in plastic, the greens will last a couple of days. Keep a small amount of root end on the bulbs to keep them from drying out and wrap tightly in plastic. They will keep about 1 week. Bulbs do not need to be peeled before eating. Wash hakurei roots well and chop into bite sized pieces. Roughly chop greens but keep them separate from the roots pieces. Heat butter and oil in a large non-toxic non-stick skillet over medium-high heat. 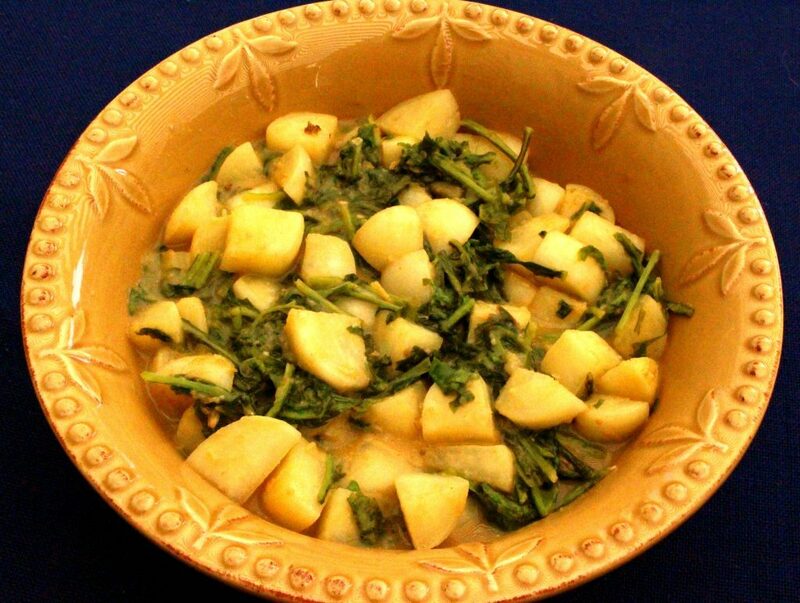 Add turnip pieces and cook, stirring occasionally, for about 5-10 minutes or until crisp tender. Meanwhile, in a medium bowl, whisk miso, broth, and rice vinegar until smooth. Add miso mixture to pan. Cook, Stirring occasionally, for 5 minutes. Add greens and cook, stirring frequently, until greens are wilted and sauce has thickened. Serve immediately. Here is another hakurei turnip recipe. This recipe is very versatile. When cabbage is not available, I use shredded broccoli stem. For Vinaigrette: Place shallot, orange juice, lemon juice, Dijon, and honey in a tall container wide enough to comfortably contain a hand blender (a tall used ricotta container works well). This will help prevent splatter. Blend until smooth and emulsified. Salt and pepper to taste. For Slaw: Either using a food processor or a box grater, grate (or julienne) turnip bulbs, apple, and carrots. Place in a large bowl. If using Hakurei greens, stack and roll up about 8 well cleaned greens like a cylinder and very thinly slice (chiffonnade). Add to bowl. Pour dressing gradually, tossing and tasting as you go (you will not need all the dressing). Add currants and sunflower seeds (if using) and toss to combine. Slaw is best when just tossed. If you wish to prepare it ahead, grate vegetables and refrigerate (apple should be grated just prior to serving). Note: Hand blenders work great for small amounts of vinaigrette. If you do not own a hand blender, double or triple the vinaigrette recipe and prepare in a traditional blender or food processor. Dressing goes great on any salad and will keep for about 1 week in the refrigerator. Another great ideas for these yummy veggies. Your posts are so helpful thank you for them. Thanks so much, Barbara. I am so happy that you find the posts helpful. Happy Eating!